Fannie Mae says the alleged Libor fraud was "willful and wanton." The government-backed firm filed a lawsuit Thursday against nine major banks over their alleged manipulation of Libor, a key interest-rate benchmark. The suit comes less than a week after a settlement in which JPMorgan (JPM) agreed to pay Fannie and its sister company, Freddie Mac, $4 billion to settle allegations that it misrepresented mortgage securities sold to the firms. Fannie says the banks' alleged manipulation of Libor caused it approximately $800 million in losses. Four banks -- Barclays, UBS, Royal Bank of Scotland and Rabobank -- have already reached settlements with the Justice Department and other regulators on the issue, paying more than $3.6 billion in fines. A handful of brokers and traders have also been charged individually, with more cases expected. Libor rates are created through a process overseen by the British Bankers' Association, an industry group, in which a group of large banks are polled on their borrowing costs in various currencies over various time periods. Their responses are then averaged to produce rates that are used as benchmarks for trillions of dollars' worth of derivatives and other financial products, including car loans and adjustable-rate mortgages. In the four settlements reached so far, the banks have admitted that traders engineered fraudulent Libor submissions to benefit their derivatives positions. The firms also admitted to lowballing their Libor quotes around the time of the financial crisis to appear stronger and more creditworthy. The other banks named in the Fannie Mae lawsuit are Deutsche Bank (DB), Credit Suisse (CS), Citigroup (C), Bank of America (BAC) and JPMorgan. 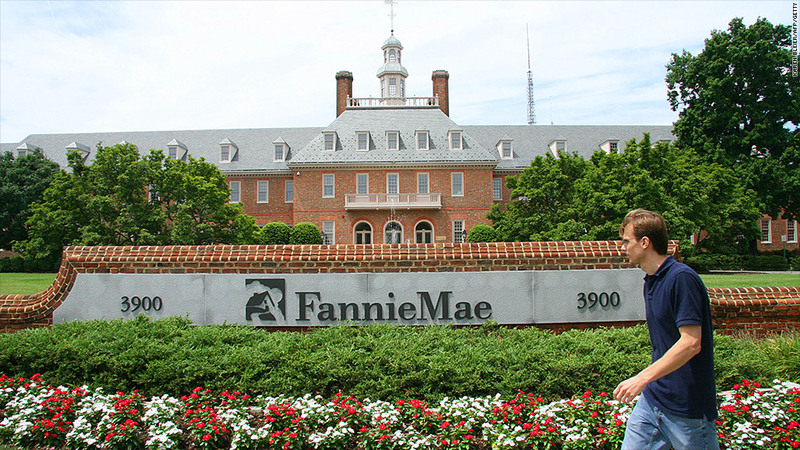 The suit claims that Fannie Mae lost money on mortgages and interest-rate swaps with the defendants when certain Libor rates were set artificially low. The British Bankers' Association is also named in the suit. "Fannie Mae filed this action to recover losses it suffered as a result of the defendants' manipulation of Libor," the firm said in a statement. "We have a responsibility to be good stewards of our resources." The banks either declined to comment or did not respond to requests for comment. Freddie Mac filed a similar lawsuit in March against more than a dozen banks. A variety of other plaintiffs, ranging from individual investors to the brokerage firm Charles Schwab (SCHW) to the City of Baltimore, have also claimed Libor-related losses. Fannie and Freddie have been overseen by the Federal Housing Finance Agency since their $187 billion bailout in 2008, prompted by their massive losses on mortgage securities. They have since returned to profitability, paying substantial dividends to the Treasury Department. The FHFA sued 18 banks back in 2011 for allegedly misrepresenting risky mortgage-backed securities, and has settled with four so far.